Background: Humanities programs in South Asian medical schools are slowly growing in popularity. Art-making opportunities within those programs, however, are limited despite their potential benefits including solidification and integration of learning. Aim: to examine art created by medical students for the breadth and depth of conceptual understanding that formed the foundation for its creation. Settings and design: Medical school in Nepal; qualitative study. Material and methods: First year medical students at the Patan Academy of Health Sciences in Nepal, in 2011, 2012, 2014 and 2016, were asked to volunteer and submit artistic interpretations of “cardiac science” during five weeks of learning about the cardiovascular system using any media. Submissions were digitally recorded. This art repository was used as the data set for the present study. Data analysis: curatorial analysis of a repository of art pieces using Rose’s criteria for critical visual analysis. Results: Four main categories were generated: Anatomy Literal Representation, Artistic Representation, Tactile Renderings, and Linked to Health/Nepal. Conclusions: From literal to artistic/fanciful representation, student’s art revealed a strong conceptual understanding of the cardiac science topic. A subset of tactile art highlighted the student’s manual dexterity and propensity for kinesthetic learning. 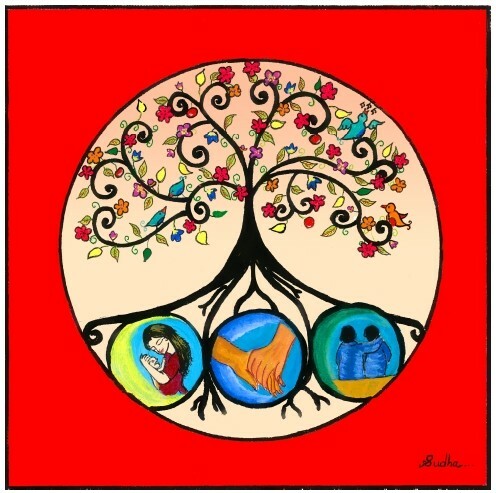 The links made by their art to socially relevant health issues, illustrated the student’s ability to connect science to the needs of their patient population, and the important role for education in disease prevention. This is the first study that has explored art-making in the context of Nepali medical education and its potential role as an adjunct to science learning. Majumder MA. Should medical humanities be a part of the undergraduate medical curriculum? South East Asia J Public Health. 2012;2(1):68-9. Shankar PR. Developing and sustaining a medical humanities program at KIST Medical College, Nepal. Indian J Med Ethics. 2013;10(1):51-3. Gupta S, Agrawal A, Singh S, Singh N. Theatre of the Oppressed in medical humanities education: the road less travelled. Indian J Med Ethics. 2012;10(3):200-3. Mercer A, Warson E, Zhao J. Visual journaling: An intervention to influence stress, anxiety and affect levels in medical students. Arts Psychother. 2010;37(2):143-8. Lyon P, Letschka P, Ainsworth T, Haq I. An exploratory study of the potential learning benefits for medical students in collaborative drawing: creativity, reflection and ‘critical looking’. BMC Med Educ. 2013;13(1):86. Potash JS, Chen JY, Lam CL, Chau VT. Art-making in a family medicine clerkship: how does it affect medical student empathy? BMC Med Educ. 2014;14(1):247. Cox SM, Brett-MacLean P, Courneya CA. “My turbinado sugar”: Art-making, well-being and professional identity in medical education. Arts & Health. 2016;8(1):65-81. Jones EK, Kittendorf AL, Kumagai AK. Creative art and medical student development: a qualitative study. Med Educ. 2017;51(2):174-83. Rose G. Visual methodologies: An introduction to researching with visual materials. 4th ed. London: SAGE Publications ltd; 2016 Mar 10. Staricoff RL. Arts in health: a review of the medical literature. London: Arts Council England; 2004 Aug.
Brett-MacLean P. Use of the arts in medical and health professional education. University of Alberta Health Sciences Journal. 2007;4(1):26-9. Cox SM, Lafrenière D, Brett-MacLean P, Collie K, Cooley N, Dunbrack J, Frager G. Tipping the iceberg? The state of arts and health in Canada. Arts & Health. 2010;2(2):109-24. Perry M, Maffulli N, Willson S, Morrissey D. The effectiveness of arts‐based interventions in medical education: a literature review. Med Educ. 2011;45(2):141-8. Miller A, Grohe M, Khoshbin S, Katz JT. From the galleries to the clinic: Applying art museum lessons to patient care. J Med Humanit. 2013;34(4):433-8. Phillips PS. Running a life drawing class for pre‐clinical medical students. Med Educ. 2000;34(12):1020-5. Shankar PR. Can medical humanities take root in Asia? J Clin Diagnost Res. 2008;2:791-5. Shankar PR, Piryani RM, Morgan H, Thapa TP. Medical humanities in Nepal - snakes and ladders. J Coll Physicians Surg Pak. 2010;20:219-20. Supe A, Burdick WP. Challenges and issues in medical education in India. Acad Med. 2006;81(12):1076-80. Pandey AS, Dixit HM. Selection criteria and pre-clinical academic performance in a private medical college in Nepal: A case study. Med Teach. 2011;33(4):e186-92. Shankar PR, Piryani RM, Upadhyay-Dhungel K. Student feedback on the use of paintings in Sparshanam, the Medical Humanities module at KIST Medical College, Nepal. BMC Med Educ. 2011;11(1):9. Liu MJ, Yannopoulou N, Bian X, Elliott R. Authenticity perceptions in the Chinese marketplace. Journal of Business Research. 2015;68(1):27-33. Duit R. On the role of analogies and metaphors in learning science. Science education. 1991;75(6):649-72. Kaneda T. Children's art activities in non/less-industrialized societies: A case study in Nepal. Art Education. 1994;47(1):20-4. Baykan Z, Naçar M. Learning styles of first-year medical students attending Erciyes University in Kayseri, Turkey. Adv Physiol Educ. 2007;31(2):158-60. Dhital R, Subedi M, Prasai N, Shrestha K, Malla M, Upadhyay S. Learning from Primary Health Care Centers in Nepal: reflective writings on experiential learning of third year Nepalese medical students. BMC Res Notes. 2015;8(1):741. Shakya S, Sharma D, Bhatta YD. Current scenario of heart diseases in Nepal: At a glance. Nepalese Heart Journal. 2013;8(1):23-6. Niraula SR. Tobacco use among women in Dharan, eastern Nepal. J Health Popul Nutr. 2004;22(1):68-74. Ramachandran V. Snakes and Ladders: Factors that Facilitate/Impede Successful Primary School Completion. New Delhi: World Bank; 2003.